Valarie Juntunen has been involved in direct health care since 1999 and began freelance writing in 1997. She is a Michigan registered nurse and attended the National Rural Institute on Alcohol and Drug Abuse, where she developed her passion for psychological- and sociological-based nursing. Juntunen holds an associate's degree in nursing from Finlandia University. A heart monitor, also known as an EKG, ECG or electrocardiogram, displays the electrical activity of the heart. Doctors, nurses and other medical professionals are required to undergo many hours of training in EKG interpretation prior to using an EKG as a guideline to administer, adjust or prescribe treatments. Lay persons can learn the basics for purely academic or interest purposes or as a building block for further study. Determine which lead you are reading. The wave forms look different in each lead depending on the perspective of that lead. In a standard 12-lead EKG, leads II, III and aVF look at the back and lower aspects of the heart. Leads V1, V2, V3 and V4 look at the front of the heart. Leads V5, V6 and aVL look at the sides of the heart. Look at the grid on the strip. Horizontal lines indicate time with each little box being 0.04 seconds and each larger box being 0.2 seconds in length. Five larger boxes equal one full second. The vertical lines indicate the voltage with each box equaling 0.1 mV. On many strips there is a darker line for every two larger boxes since 10 smaller boxes equals 1.0 mV. Find and label the P-wave, which is often most noticeable on lead I. Most P-waves are small bumps that come just before the main complex. However, the P-wave can be shallow, occur multiple times in a row or otherwise be difficult to detect depending on the heart rhythm. Find and label the QRS complex or main wave form. Q-waves are rare but if present dip below the baseline at the beginning of the QRS complex. The R-wave is next and is typically a tall, spiky wave. This is followed by the S-wave which goes below the baseline, sometimes in a long, sharp spike. Locate the T-wave and label it. The T-wave is generally a small bump that follows the QRS complex. The T-wave can be difficult to find in some patients due to flattening, inversion or confusion with P-waves. Locate the P-wave. This is where the sinoatrial node fires causing electricity to move through the atria. Each P-wave should be followed by a QRS complex. The normal interval between the P-wave and R-wave is 0.12 to 2.0 seconds. Anything longer may indicate conduction abnormalities. More than one P-wave or P-waves that seem to flutter can indicate atrial fibrillation or flutter--conditions in which the atria do not effectively contract. Look for any Q-wave formations. If present it may indicate a previous heart attack or damage. The ventricles discharge and contract at the QRS complex. Count the number of big boxes between two R-waves to determine heart rate. Divide 300 by that number. 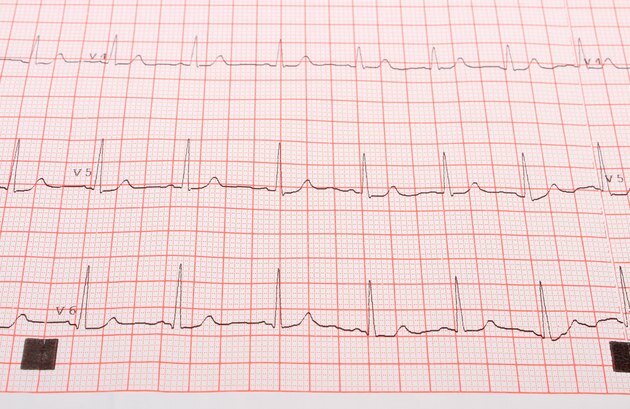 Determine a heart rate with irregular heartbeats by counting the R-waves on a 6-second strip and multiplying it by 10. Rates greater than 100bpm are considered tachycardia and slower than 60bpm are considered bradycardia. QRS complexes that occur close together without P-wave formation are an indication of ventricular fibrillation which can be life threatening. The space between the S-wave and the T-wave is known as the ST segment. Elevations in the ST segment can indicate an acute myocardial infarction, or heart attack. There are a variety of nuances to ECG interpretation. Study advanced cardiac life support, or ACLS, to learn about abnormal ECG findings and their treatment algorithms. Spikes that appear at regular intervals on ECGs are often caused by pacemakers. Only highly trained medical professionals can definitively interpret heart rhythms. Electrical activity shown on heart monitors does not always relate to the physical action of the cardiac tissues--always assess the patient first, not the EKG strip. Can You Lift Weights After a Pacemaker is Inserted?